If you need braces, then ask us about our new and improved way to straighten teeth. Modern-day braces are much different than they once were, and you can have your teeth straightened in more attractive and less distracting ways. How braces are different from how they once were? In the past, your only choice for braces treatment was large, unsightly, and noticeable metal braces that detract from the natural beauty. 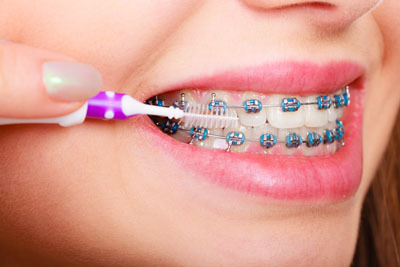 Today’s braces are verging on invisibility and consist of materials that are less irritating to your gums and cheeks. The materials that braces consist of are also more biocompatible, so you do not have to worry about teeth discoloration, constant discomfort, or blemishing during treatment. When you receive braces, you will be able to customize them to your aesthetic taste. We offer clear and tooth-colored options now, so braces will not be the first thing people notice when you smile. The braces components are also more comfortable than they used to be. With modern braces, you will not have loose wires or brackets nearly as often, due to better adhesives, and we will provide you with the necessary tools to combat discomfort until you can visit us if something comes loose. For more information about how the structure of braces is different than it used to be, visit our office. Are treatment times shorter than they used to be? Treatment times tend to be shorter now since modern braces provide a more streamlined straightening process. The adjustments that are made cause less discomfort and provide quicker routes to straighter teeth. Since the braces do not block as much of the teeth, patients may even be able to notice when the teeth are beginning to look straighter. Most people wear braces for a year to 18 months, but these times vary depending on the dental structure before braces treatment. Cleaning the teeth and braces is easier as well. Now, there are tools we provide or over-the-counter for patients to use when flossing and brushing. Modern tools allow for easier access to hard-to-reach areas, so cavities do not develop during treatment. Thus, the teeth do not become discolored. We will show you the correct way to brush and floss during braces treatment to prevent cavities and gum disease. Will I still need to wear a retainer after treatment? Retainers are necessary for all patients to wear after a braces treatment. Patients need to wear retainers for a short period of time each day that we will determine after removing the braces. Patients do not need to wear retainers all day but will need to wear them at certain times of the day. Patients who wear their retainers at night will allow the teeth to adjust to the new location in the mouth. Today’s retainers are comfortable and virtually invisible on a patient’s teeth. These are a few of the ways braces are new and improved. For more information about how to have your teeth successfully straightened, visit or call us at (281) 477-7200. Why Stay Awake When You Can Try Sleep Dentistry?